note: each sheet pan will hold 3 servings. Toss the veggies in about 2-3 tablespoons of olive oil, or enough to lightly coat them, and season with salt and pepper. Lay them out in a single layer on a sheet pan. Don't crowd the pan. Cook for 10 minutes, maybe 15 if your veggies are on the larger side. Lightly season the salmon with salt and if you like you can brush on a layer of honey or marmalade. Top with the sliced lemon. Remove the pan from the oven and give everything a good stir. 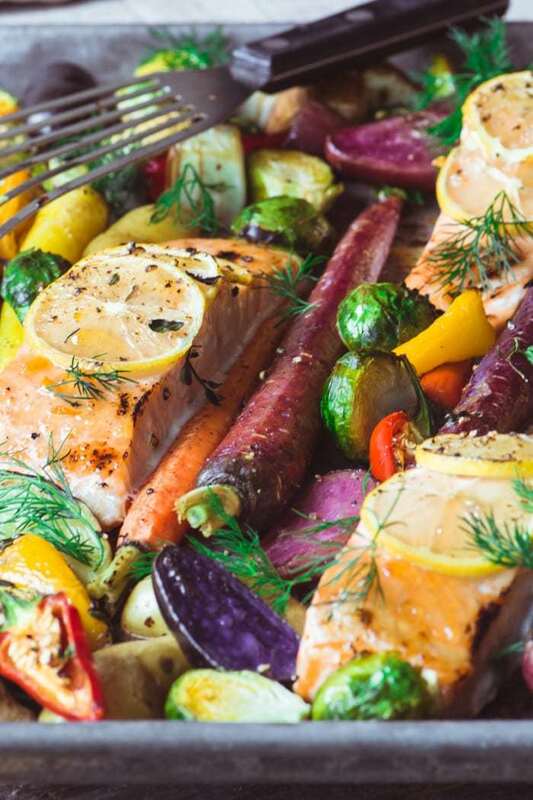 Make room for the salmon and nestle it in among the vegetables. Roast for a further 20 minutes, or until the salmon is cooked through and the vegetables are browned and tender. Serve with a sprinkle of fresh thyme or dill.